One thing you have to say about Brain Surgeon Theater’s latest production: they do crowded tenement right. 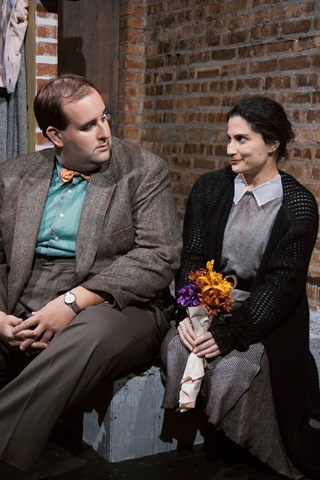 In fact, 1512 West Studebaker Place maintains such a solid 1930’s tone, it’s hard to believe it’s a contemporary original production—the idea conceived by Liz Ladach-Bark and Joseph Riley, the play written and developed by the ensemble cast, with original music by Christopher Cole and Gwen Tulin. It has all the look and feel of a work that could have been produced from one of the New Deal’s arts programs. Even its incomplete finish does not diminish the ensemble’s achievement in the depiction of suffocating economic despair. 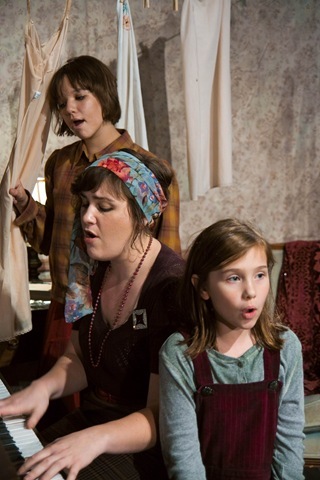 The production’s greatest strength is its realistic and cohesive integration of adult and child players. 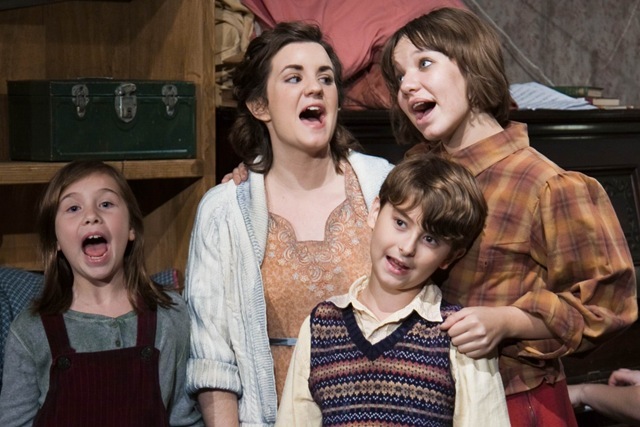 The Kelly family, headed by Stanley (Buck Zachary), wife Olivia (Katie Canavan) and sister Louise (Gwen Tulin), with their daughters Kate (Layla Kornota) and Suzy (Megan Bishop), live cheek-by-jowl with fellow borders Mim (Amy Gorelow), her niece Juliet (Laura Deger), writer Walter Lummet (Jacob A. Ware) and his little boy Mouse (Ethan Baum). Months of back rent are due to landlady Maggie Delaney, executed with absolutely sinister menace by Lauren I. Sivak. Maggie Delaney walks in and out of their home without bothering to knock on the door. She involves Suzy in a secretive scheme. Bit by bit, she takes everything her tenants own—even callously wearing a hat that Louise has had to give up with the rest of her elaborate wardrobe. But the Kelly family may be just as much at the mercy of Stanley’s unrealistic hopes of owning a toy factory, as they are the economy. In fact, as naturalistic as family and tenant interactions are in this play, what strains credulity the most is Olivia’s enduring, patient acceptance of Stanley’s pipedreams and procrastination. The weakest moments of the play come at the end. When there is finally nothing left for Maggie Delaney to take, everyone gets thrown out of the house. Even a dutiful 30’s housewife would have something to say in response to the loss of her home and the imperiled state of her children, but Olivia remains silent in the face of Stanley’s insipid reassurances. The children’s games and songs in the play say volumes about living in poverty, often more than the play’s text itself. The plot developments, such as the revelation of a hidden safe in the house and a budding romance between the silently despairing Mim and butcher’s assistant Clarence, played warmly and compassionately by Rob Grabowski, deepen the world of the play and provide relief to this work’s unending hopelessness. 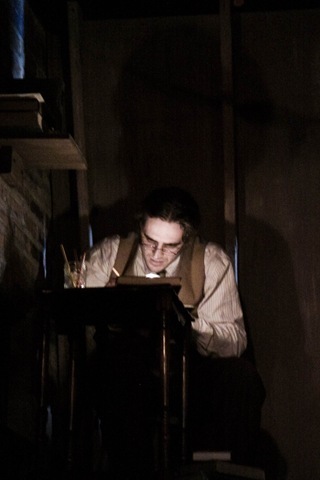 The plaintive figure of Mouse, jeopardizing his life by crawling out his attic room window to sit and sing in a tree, remains one of the play’s most enduring images. What gets lost in a muddle on stage, at the end of the play, is the dramatic significance of Mim opening up and speaking to him–a problem that could be resolved with some clean up in direction. 1512 West Studebaker Place is still incomplete and audiences should consider it very much a work in progress. But the Brain Surgeons have gotten it this far. The bones of a really good play are there. Let’s hope they will take it the all the way home. Read additional Studebaker Place review, by Henry H. Perritt, Jr., by clicking on “Read more”.